A few people already know the ADS/JAXA sea ice thickness and melt concentration product. It is derived from various AMSR2 scanning frequencies. The melt concentration makes it hard to estimate the sea ice volume, because you can't just read out all individual cell values and calculate the sum. To overcome this issue I developed a melt algorithm which estimates thinning based on the melt concentration percentage and the number of days it occurred. The algorithm also estimates freezing of open water from the melt concentration. Anyone interested in the details can look at my short documentation. The AMSR2 thickness isn't as accurate as PIOMAS for actual sea ice thickness. It's definitely affected by melt pond refreezing in August, which almost cancels out further volume losses and thickness increase is rather slow in October-November. As indicated with 2017 it counts snow cover as additional sea ice volume like CryoSat did. If ones aware of these artefacts it's still a very useful tool to judge current sea ice conditions. Refreezing melt ponds mean a quick end to the melting season and additional snow has to melt in spring before the sea ice melts. Further it has a higher spatial resolution (10km) than PIOMAS and a higher temporal resolution for the entire Arctic than CryoSat. I'm a little bit puzzled on the physicality of your melt algorithm, which appears to diminish the thickness of thick ice much faster than that of thin ice. In actuality, the thickness has to decrease at a rate governed by the energy input into the ice (from sun, air above, and water below). None of these energy sources input energy at a rate proportional to the thickness of the ice. What gives? By the way, you ought to open source this on Github! Does the data exclude the parts of Okhotsk beyond the periphery? Beautiful btw! Looks like these past few weeks have been weak on volume building as gains have been focused on the outer seas while the peripheral core has actually seen losses. You are right thickness decrease depends on solar intensity, air/water temperature and so on. 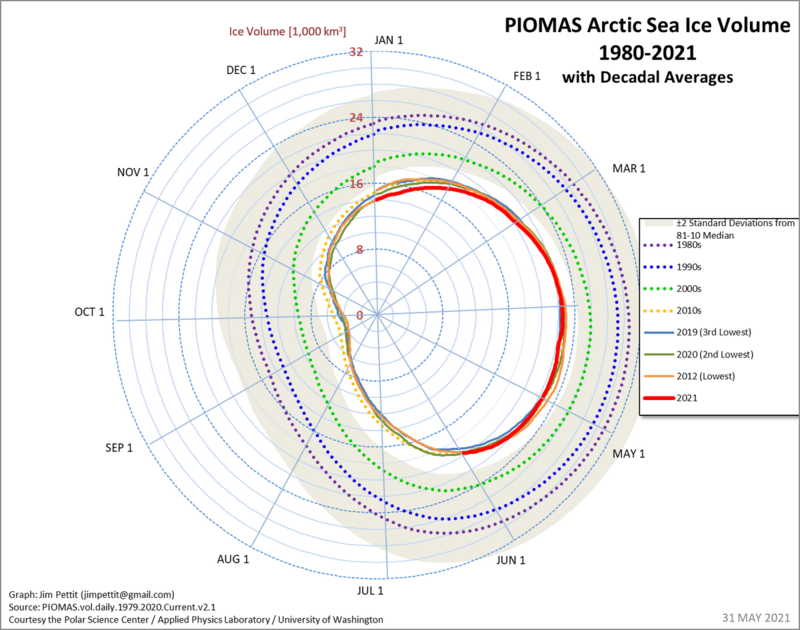 But I'm not developing a sophisticated weather model for sea ice melting like PIOMAS did. It't just a simple algorithm to smooth out the thickness measurements. I fine-tuned the algorithm several times before making it public with several test runs. I allow thick ice the melt faster because at the start of summer ice thickness is overestimated due to snow cover or simply too high compared to other products from models like PIOMAS to Buoy measurements. The Arctic simply doesn't have huge areas of 4-5m thick ice anymore. From the comparison graph you can also see how jumpy the raw data is. On the raw thickness measurements 5m thick ice can suddenly flash in and out of existence for a few days. This is the main reason why I limited the maximum thickness change to 5cm per day in my algorithm. About Github: Yeah I should probably post it there. At the moment my code is a mess and very hard to read. Currently none of my code contains any comments explaining functions. The only comments are deactivated code for test purposes or to change the program slightly. Yes the code excludes everything south of 50N. ADS/Jaxa didn't provide a region mask for the data and I found 50N to be a good compromise between excluding non Arctic waters (Great lakes, Aral sea, Caspian sea) and including still relevant ice areas like Hudson Bay. The excluded regions of southern Okhotsk and the Gulf of St Lawrence are not very relevant in ice volume and influencing the Arctic climate. Cutting them off shouldn't harm the overall picture. Thanks I spend about one hour choosing a good colour bar and selecting a good thickness range to show variations in thin ice cover. AGW deniers sit on 2012 as a benchmark sea ice low, even tho a fortuitous storm broke up much ice in that year AND equally fortuitous winds drove much of the easier to move busted sea ice into the North Atlantic. AGW deniers also hide behind the solar TSI(yet don't mention it in recent years), which has been languid for half a century, & low for the last 11+ years(including a 3+ year period setting a 100 year record low). All that mentioned has been in AGW denier favor. Yet, AGW deniers don't mention that recent Arctic sea ice Volume has ranged between 8000 to 12,000 cubic kilometers LESS than the average of the 1980's. As it stands today, 2018 is set to challenge 2014 for the highest minimum since 2012. Please excuse me if I'm just being stunned- it is early morning here.... But I don't follow you. Can you expand on your post please? It is still in the season, and anything could happen. Based on the current higher [relative] volume, and litesong's statement about a low TSI, it seems that is where we are headed. Based on the current higher [relative] volume, and litesong's statement about a low TSI, it seems that is where we are headed. Average Arctic sea ice VOLUME for May 1, for the period 1980-89, was ~30,600 cubic kilometers. May 1, 2018 Arctic sea ice VOLUME is ~22,200 cubic kilometers, 8400 cubic kilometers LESS than the 1980-89 period for May 1. The excess AGW infra-red energy absorbed by 8400 cubic kilometers of ice to melt it, is ~ 30 times the yearly U.S. energy consumption. The use of the year 2012 is NOT a year that AGW deniers should base any AGW denier claim. AGW denier daniel's obvious mis-use of my mention of TSI is wrong. My correction is that if solar TSI remains low(& lower?) AND IF present Arctic sea ice VOLUME returns to monthly quantities as in the 1980's decade AND higher, then AGW denier daniel has "sumpun ta crow 'bout". Till such happens, AGW denier daniel has to throttle back its posts. It is rather early to be making claims like this. I presume you have some facts to back this we can examine? Yes, check out the volume charts a few posts back. I'm afraid you are going to have to be more specific and detailed. Jim Pettit has already give you a serious challenge. Alright, I will repost the graph from Nightvid Cole. Notice how the current volume is nearer the higher volume year of 2014. Maybe just go to the site directly. I've been to the site, and I see the graphs. They in themselves are not sufficient explanation. They simply record history. What you need is to describe *how* you think your expected numbers will be achieved. If my experience following the arctic tells me anything, a purely statistical analysis is more likely to result in error than not, and reveals nothing as to how the numbers were acheved. The name-calling weakens your arguments. At the same time Daniel B is going for the provocation a bit. What he should have said, is: As it stands today, 2018 is set to challenge 2014 for the highest minimum since 2012, in this particular dataset, using Tealight's methods. Not for all volume products, like PIOMAS, or 'real' volume. Thank you Neven for comprehending and stated my post more clearly. Very late update this month. I lost all my Cryosphere data due to some problems with new computer hardware and had to recover everything. Most of the stuff I created in the last two month was lost. Daily images & NETCDF files for the thickness data should be available soon. Are the monthly Map&Melt gifs available somewhere on the cryospherecomputing site? binntho, I doubt if it explains everything, but for a more valid comparison you need to compare PIOMAS to NSIDC extent, which has much larger grid cells and lower accuracy. I agree with Binntho. No gridded cells could explain that difference. But in fairness, the PIOMAS is a better effort than the AMSR volume chart posted earlier by Tealight. Look at the two areas circled in black. Parts of Area A in the Laptev were still not fully ice covered in early November and now it is supposed to be nearing 150cm thick ! PIOMAS puts the same area in the 75cm to 1m bin. Which is probably even a little generous. Meanwhile Area B shows a river of blue going right up the centre of the Arctic Basin. That's less than 50cm thick. Clearly incorrect. In defence of Tealights stalwart efforts, I ran interferometry on ascat for november (thank you A-Team) and there is a hint of lower concentration along the old ice front. Perhaps the newer, rapidly formed ice is more mobile than the older ice. subduction effect maybe, or just reflection angle waves? Polarview yesterday. A couple of fractures in a similar direction. sorry, I haven't been able to do any Arctic reading this week. The gif has a special page on cryospherecomputing, but all data stored on Google Drive. I've been brooding over PIOMAS volume data the last 3 days, following some discussion elsewhere about trends vs "weather" and the kind. I'm staring here as I write at 4 graphs I derived from the PIOMAS data downloaded from the U.of Washington Polar Science center. I'm pondering what it implies about past changes in the Arctic and what import it has for the future. Let me back up for a moment and describe what I've done first, and why. There's been a lot of discussion on the Arctic forums recently around three dimensions we use to evaluate Arctic system health. In our discussions and arguments we've wrestled with the reality that two of those measures - extent and area, particularly as they appear at the end of melt season - have become increasingly difficult to evaluate to make a skillful determination of how the Arctic will look in a few years. Our discussion has shifted and expanded now to where over the last two years there has been much more tracking and examination of the annual refreeze. This has given us some hints and generated quite a few more questions. My analysis is more empirical than theoretical. At this moment I'm less interested in prediction than I am the data set. I have a particular interest in volume as well. Unlike extent and area, it represents a far better proxy for key forces at work in the Arctic - heat exchange and total system enthalpy. My second purpose is contrast volume changes with changes that have taken place during the time period in question and see if a pattern appears which follows or is affected by them. Simply digesting a raw and fairly substantial pile of data is unlikely to produce anything useful. However, I don't want to fall into the trap of over-analyzing the information - while it is good to reduce "noise", over-processing values can remove meaningful signals it contains. My approach to this is three fold. 1) Create a sample average from a meaningful but more controllable time frame. Most analysis of this data has been around extreme endpoints in annual variation - the annual maximum extent/area/volume and corresponding minimum - which land on arbitrary dates and are very narrow samples. For my work here, I've picked to arbitrary but significant dates March 21 (Day 80/81 of each year) and September 21 (Day 260/262). I then averaged the daily volume for a time frame window which extends from two weeks before until two weeks after those dates to get what I call "Vernal" and "Autumnal" volume numbers for those dates. My logic in doing this is this: Rather than use a metric which is volatile and fundamentally disconnected from other forces in play at the time they take place (annual minimum/maximum), I wanted to anchor the analysis to two specific points in them where we know predictable and measurable changes are taking place (the Spring and Fall equinoxes). Further, to make the new metric sensitive to conditions during the specific year and season, rather than simply pluck out one number, an average over a near-term time frame would better incorporate and smooth other signals from forces in play at the time. In addition to these two numbers, I also created a baseline value for tracking behavior on a broader time scale. In this case, I created an annual average for each year, summarizing all volume measurements from January 1 to December 31 for each year in question. 2) Create a derivative average which further smooths the Vernal and Autumnal numbers over a wider time frame. In this case, I created a second data set from my spring and fall averages, starting with 1983, which is a simple 5 year running average of those numbers. The goal here is to round off peaks and valleys without losing all of the signal they contain, and hopefully permit underlying trends to be more visible, and more importantly, better identify transitions in system behavior. 3) Create a third derivative/index to show system volatility. At the start, these were actually the numbers I was most interested in. We've discussed this some on the forums, but the summary of my thought here is, this, and also may qualify as a hypothesis: As the Arctic as a system approaches behavioral limits, the volatility of the system - the relative change against base values - will increase. Again keeping it simple, I created three values for each year in question. These were (a) The absolute difference between Vernal and Autumnal values (b) the Percent that value represented of the Vernal volume and (c) the Percent that value represented of the Annual volume as derived in (1) above. I did this for both the raw and 5 year running averages of Vernal, Autumnal and Annual values. Note: all values I used were rounded up to three decimals. I figured the significance of fractional cubic KM of ice were meaningless based on the confidence of the measurements. From raw data and graphic analysis by Jim Pettit, Zach Labe and many others it's already clear that sea ice volume has been declining steadily over the time period in question. What isn't necessarily clear is the nuances of how those changes have taken place. Both the smooth and averaged data clearly shows this trend. No surprises (nor were any expected). However, annual seasonal loss has shown only a very modest increase - less than 10% over all - with an average of 14.242K KM3, median of 14.034K KM3 and deviation of 1.164K KM3. Breaking the loss dataset in half shows the 2nd half loss rate only increasing by about 1000KM3, and 2nd half loss volatility actually declined slightly. The 5 year running averages are correspondingly closer. This suggests strongly that large year to year variations in melt are not significant contributors to the reduction in volume over the period measured. The first think that jumped out at me in particular in the averaged data, is I think I'm seeing two historical locations where I think there's a signal identifying a fundamental change in how the system behaves. The first is in the 1990-1994 time frame. There I think spring, fall and yearly average graphs start a break in slope, falling into the glide path that takes us down hill to where we are now. I'm not sure what the specific conditions were at the time, or, considering hysteresis, how far back we need to look for the trigger, but it strikes me that is a specific place in time and space we can point at where the system signals a change has taken place. The second was the 2010-2013 time frame. in that range all three measures - Annual average, spring and fall - flatten out. As another interesting and possibly key item, annual loss intersects and then starts to follow the annual average curve. I'm not sure what this means yet, but it sure looks like a strong signal. Also, while the three major curves flatten, the *vernal* curve is still trending down. I think the running 5 year equinox graph shows this the best. My general take away - I think the graphs support another of my thoughts - that as the total energy available to the system increases (reduced ice), the overall volatility of its metrics will increase - especially area and extent - which actually are more derivative of this than volume. I'll be interested to hear what other folks think. If someone can point me in the right direction, I'll post the spreadsheet with my raw numbers someplace for people to tear apart. B. I pressed Like before I was halfway through. C. Looking at the first chart, there obviously was no stall in 2007, but perhaps there was one in 2012. D. I think I see several regimes in the chart: around 1995 started "slowly eating away". Around 2005 started "loss reached critical mass, system is falling apart", around 2015 "losses slowing as less ice is to be found". 1995 and on, losses remained very similar, but the arctic slowly shrunk year over year. 2005 and on, losses started rising while the arctic crashed. I take that as the ice cap - having become weak and uncohesive and mobile - became vulnerable to export of a large part of the MYI and resulting loss of most of the rest. 2015 and on, with the vernal volume continuing to shrink, and almost no vulnerable MYI remaining, losses are slowly shrinking, resulting in relatively constant autumnal averages. I think this could mean that nearly ice-free conditions will be dictated on average by vernal (max) volume, as it continues to decline, rather than by total melt, though that may play prominently in single years (e.g. 2012, 2016). I would be very interested to see another variable on the same chart - the autumnal to vernal gain, as that seems to be shrinking, and is potentially the physical process that may kill off arctic sea ice, given seemingly constant melt. Look for it in a day or so. Winter gain shadows loss... but consistently slightly below it. AMSR2 thickness and volume ties with 2013 and 2014 for the highest values. The second was the 2010-2013 time frame. in that range all three measures - Annual average, spring and fall - flatten out. As another interesting and possibly key item, annual loss intersects and then starts to follow the annual average curve. I'm not sure what this means yet, but it sure looks like a strong signal. Possible, of course. However, my thoughts were that as the spring maximum declines, there is less ice and what remains is in harder to melt places. We are quite likely to have a maximum of melt which necessarily is followed by a decline. Could this be what we are seeing and the correspondence to the average level (and rate of decline?) is more like a co-incidence rather than one following the other? Late thanks for this. The result surprised me a bit but shouldn't have. In a consistent downtrend it should be obvious that gain shadows loss but lags behind it. Comparison of Tealight's amsr2sit and 1day interference on ascat during december 2018. Each interference image is created by combining images from three consecutive days in RGB, highlighting ice movement. As the band of thinner or lower concentration ice along the old ice line is still visible on both animations, perhaps it is caused by the difference in movement of thicker and thinner ice. edit:While talking my wife to sleep (helps insomnia apparently) I realised the interferometry animations were incorrect. Apologies to A-team whose method combines d1,d2 d2,d3 and d3,d4 but the last few I have posted combined d1,d2 d2,d3 and d1,d3 which compares 3 days, not 4 and over different time frames. While correcting the error I tried comparing d1,d2 d1,d3 and d1,d4 which seems to improve definition of the old ice line. I've updated this animation with latter version. Sleep well. The animation on the right makes me think it is showing waves, rather than just ice movement. When a crack opens up, the crack moves/changes slowly but the waves stream along it. Yes, or a weather system moving overhead. If you a make a mess of A-Team's methods, plus mention the DMI >80N chart a few times, maybe it will bring A-Team back! I think he's still hacked off over people using his and other people's stuff from the forums and not citing it in their research. I agree jdallen, but one can always hope. This forum could use a scientific boost from someone of his caliber. That's really cool Uniquorn. Maybe you can use this to show the effect of HP over ice this coming week... Just a suggestion. I thought only A-Team was capable of improving A-Team's techniques, I was wrong... Was I? Sorry that didn't paste too well. 'Ascat interferometry' looks really useful. Is there any chance of a slightly more step by step description of this process? I'd like to try to compare this year to previous years. It will be interesting to run the correct method on the post SSW weather. On that topic, how exactly should someone cite work or analysis from contributors to ASIF? Especially, is there any guidance when members use a handle-name instead of their real names? Sending a PM requesting permission to do so would probably work .. This years cold January, which is very similar to the 2000s instead of the 2010s forces the AMSR2 thickness and volume to record high since the first available January data in 2013. Page created in 0.055 seconds with 27 queries.